UNLV enters the biggest week of its young season with a perfect 6-0 record after defeating Southern Utah, 101-82, on Saturday night at the Thomas & Mack Center. The Thunderbirds (2-3), 24-point underdogs coached by former UNLV and Findlay Prep coach Todd Simon and picked to finish 12th (last) in the Big Sky Conference preseason coaches’ poll, trailed the Runnin’ Rebels by just two points (76-74) with 6:50 remaining and were within five points, 84-79, with five minutes to go. But UNLV closed out the game with an impressive 17-2 run highlighted by consecutive 3-pointers by guards Anthony Smith, Jordan Johnson and Amauri Hardy to win going away. The Runnin’ Rebels shot 54.4 percent from the floor, including 61.3 percent in the second half, and had three players finish with double-doubles in a game for the second time this season. Johnson led the way with a season-high 24 points and 14 assists while junior forward Shakur Juiston scored a career-high 22 points and grabbed 16 rebounds and 7-foot freshman Brandon McCoy added 15 points, 14 rebounds and career-high six blocks. The Rebels now face their toughest challenge of the season of Wednesday night when they traveled to Northern Iowa (5-2), which hung with No. 5 ranked Villanova for most of the game before losing, 64-50, in the championship game of the Battle 4 Atlantis Tournament on Friday. UNLV returns home on Saturday to host Arizona (3-3) at 7 p.m. at the Thomas & Mack. KEY PLAYER: Johnson made up for a team co-high five turnovers by scoring a team-high 24 points, including 2-of-3 3-pointers, to go with 14 assists and fueled the game-ending 17-2 run to put the game away. UP NEXT: The Runnin’ Rebels play their first road game of the season on Wednesday night when they travel to Missouri Valley Conference heavyweight Northern Iowa (5-2). The 5 p.m. contest, part of the famed Mountain West-Missouri Valley Challenge, will be streamed on ESPN3. Don’t expect either team to come close to scoring 100 points in this one. NOTEABLE: Juiston has grabbed at least 16 rebounds three times this season. … UNLV broke the century mark in scoring for the second time this season, the first time since the 2015-16 season the Runnin’ Rebels have scored 100 points in a game twice in a season. … Southern Utah forward Jamal Aytes, briefly a Runnin’ Rebel before transferring to BYU, had 19 points and 10 rebounds in just 22 foul-plagued minutes and more than held his own against the taller McCoy in the lane despite giving up six inches in height. 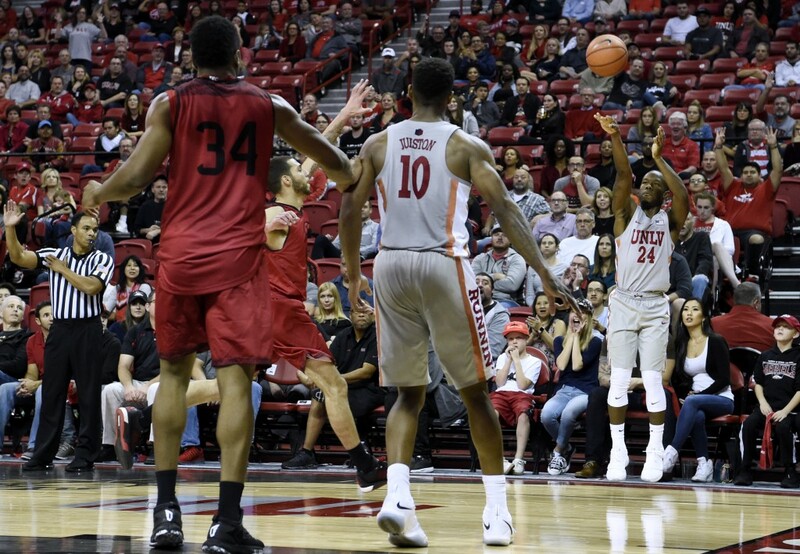 … Continuing a trend in home games at the Thomas & Mack, UNLV attempted 21 more free throws (30) than Southern Utah (9) and finished with a 20-6 edge in free throws made. … Southern Utah, which had 15 offensive rebounds, finished with a 52-50 edge in points in the paint and a 15-7 advantage in second chance points.